NOTE: If your fabric is too wide (or not wide enough), purchase 1 1/4 yards and cut in the direction of the selvedge (from top to bottom) instead. Mark the center of the long edge and stitch across it. Drop in a scant 1/8 tsp of crystals on each side of the seam (I used Watersorb, make a test tie with the brand you're using to be sure this isn't too much/too little after it's soaked). Mark 4 1/2" from the center seam and seam again. Now you have 2 pockets with crystals. Drop in another scant 1/8 tsp of in both sides and seam like before (4 1/2 inches from the first set of seams). You should have a total of 4 pockets. NOTE: Some people make 2 pockets that are 9"/10" each, and some make just one 18" pocket. For longer pockets, adjust the quantity of granules accordingly. Serge ends (or fold in raw edges and sew across) to finish ... I personally prefer the ends diagonal. THE SHIPS PROJECT: please tuck in and sew, do not just serge to finish ends. Check the Watersorb site to order the crystals in bulk. I personally like this brand the best, it requires some 50% less than the brand I bought in the garden department. If ordering from Watersorb, order the "medium" granules. 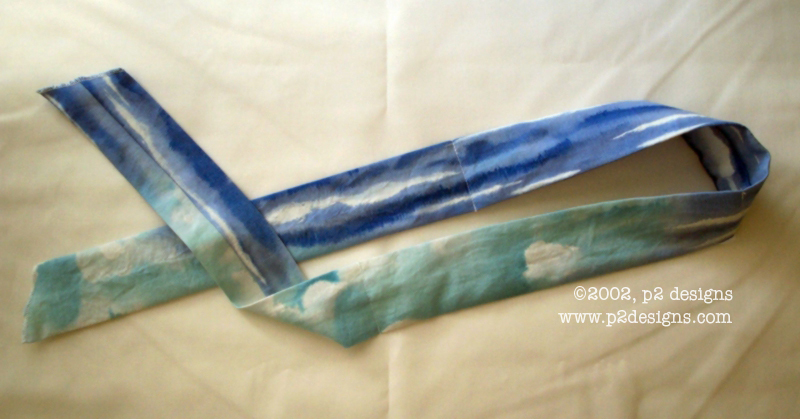 NEW USE: The Ships Project has received word directly from a contact at Watersorb® that cool ties made with Watersorb® brand crystals can also be heated in a microwave (once they have been soaked, of course). They will purportedly retain heat about 3x times longer than they will retain cold. ties can be heated (briefly) in a microwave. take care when removing as they will be extremely hot!